Cake baking is an institution of British and Irish food. 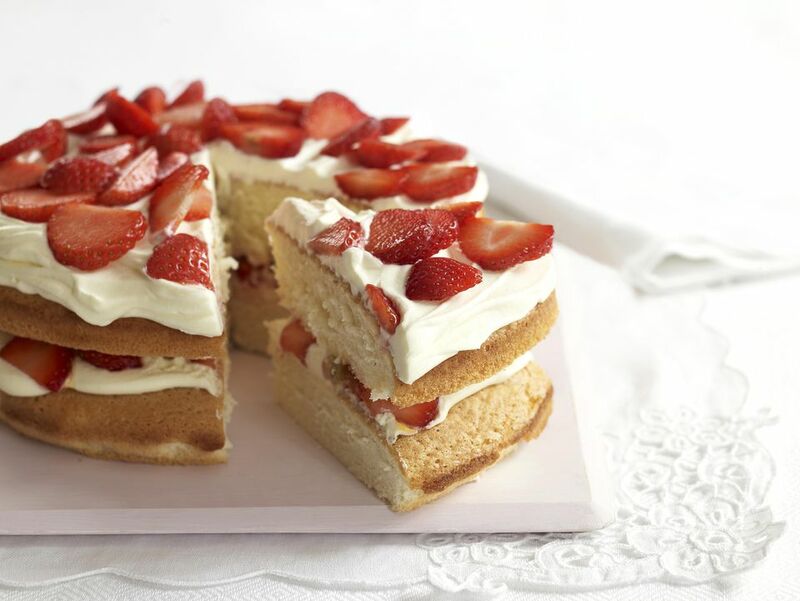 Nothing celebrates this tradition better than a sponge cake, and one filled to the brim with summer strawberries and freshly whipped cream - summer on a plate. This strawberry and cream sponge cake is essentially a Victoria sponge cake but rather than a filling of jam, fresh fruits are used instead. The making of a Victoria Sponge cake is not as daunting as most people think, you just need to follow a few simple sponge cake making tips outlined below and watch your cake rise as light as a feather. Lightly grease two 8"/ 20 cm sandwich tins. Line the bottom only with lightly greased baking parchment. Using a stand mixer, or electric hand mixer, mix the eggs, sugar, flour and baking powder and the softened butter and margarine until completely combined. The mixture should be a soft consistency. If you don't have an electric mixer you can use a wooden spoon. Divide the cake batter evenly between the two cake tins—you may weigh them to make sure they are the same, but this is not essential. Lightly smooth the surface of the cake and pop them onto the middle shelf of the preheated oven. Cook for 25 minutes or until the cakes are well risen and golden brown on the surface. If the cakes are browning too quickly lower the temperature just slightly but do not be tempted to open the door. Once they are risen and brown, you can open the door to check, gently press the center of the cake it should spring back quickly. Remove the cakes from the oven and place on a cooling rack for 5 minutes. After the 5 minutes, the cakes should be shrinking away from the sides of the cake tins. Carefully remove the cakes from the tins and leave to cool completely on the cooling rack. Once cooled, place one cake cooked side down onto a plate. Cover with a thick layer of strawberries followed by an even thicker layer of whipped cream. Top with the second cake. Dredge** with the icing sugar, extra strawberries if you want to and even a second layer of cream should you be feeling decadent. Serve with a nice cup of tea. NOTE: You can change the filling of the sponge cake to make the most of any seasonal soft fruits such as fresh raspberries or if you don't have fresh fruits then use a good thick layer of fruit jam. Do not use frozen fruits; they will not support the cake and make it soggy. To dredge the cake, place the icing sugar in a fine sieve and shake over the cake.